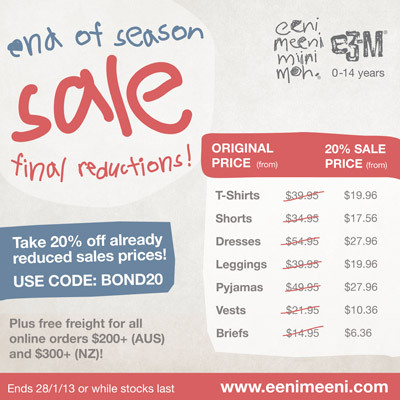 The eeni meeni miini moh and e3-M end of season sale is drawing to a close, and you can save an extra 20% off the already reduced sales prices with a special code for Bondville readers: BOND20. How cool! Simply enter the code at check-out in the online store. There is also free freight for all online orders over $200 (AUS) and $300 (NZ). Offer ends 28th January 2013 or while stocks last. You'll have to be quick! Read more about this amazing Bondville sponsor and Australian kids' lifestyle brand for children newborn-14 years: eeni meeni miini moh and e3-M here on Bondville.